I’ve just been on a voyage of discovery. And adventure. And collaboration. I’ve travelled some 1,000 kilometres northeast, another 1,200 kilometres west, and finally, 500 kilometres back home to Livingstone. What a vast, empty country Zambia is, yet it’s home to 72 different tribes. These past six-and-a-half weeks, on a food safari with Time + Tide Zambia, I’ve worked with people from three of these tribes — chiNanja, Lozi and a scatterling of Bemba — and learned a whole lot more about traditional and wild ingredients found in their neighbourhoods, many of which were entirely different from those found here in Southern Province. In the forthcoming weeks I shall be writing about this voyage: about what I learned, about what I taught, about a creative collaboration between me and my adopted home. Orange and yellow ndwi-ndwi chanterelles, and brown nakandama mushrooms sold in Mongu market. 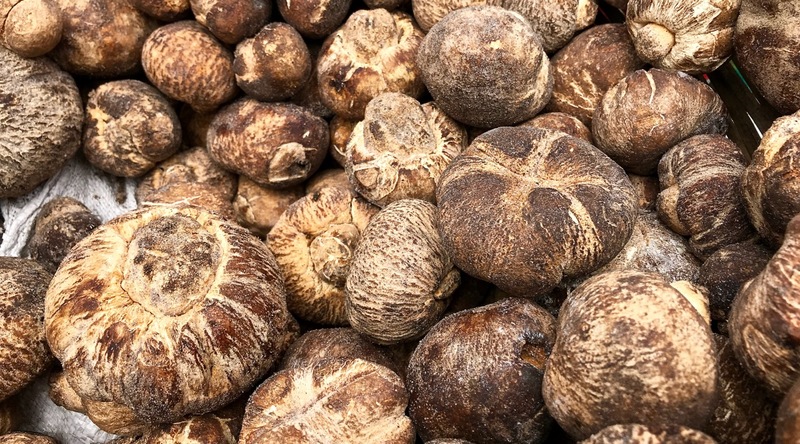 Perhaps the most exciting for me was finding the eye-popping varieties of wild mushrooms in Mongu, the capital of Western Province, which balances atop the eastern edge of the Barotse Floodplain of the upper Zambezi River. Here on the farm I’m used to eating just two types of edible wild mushrooms that grow in the bush surrounding our house. I’m also aware of an additional two varieties found further north of Livingstone, one of which can grow to the size of a bicycle wheel. What I didn’t know was the sheer diversity in colour, texture and size of edible wild mushrooms found in the unique ecology of Western Province, with its prize find, at least for me, being the Kalahari truffle. Fresh vegetables, alongside wild mushrooms and truffles, being sold in Mongu market. Sibiti mushrooms, so called because they resemble a liver. Sibiti in Lozi means liver. There’s a part of me that takes issue with the terms “hunger months” or “famine food”, to which often the wild edibles are referred, because it’s as if these ingredients are beneath those people who can afford to shop in any season in Western-style grocery stores. Wild or indigenous food is often looked down upon by the so-called affluent, who instead purchase sugar-laden, processed foods and drinks, chemical-laden fresh produce, and dairy and meat laced with antibiotics from foreign supermarket franchises dotted around Zambia, all of which are contributing to a growing diabetes epidemic. Wild mushrooms are traditionally gathered in wicker baskets by women. These are mwambwa wa lindondwe mushrooms. For this reason, it gave me real pleasure feeding Zambia’s Ministers of Tourism and Works & Supplies, who were guests at Time + Tide’s King Lewanika Lodge when I was there training the chefs in my bush gourmet cuisine. Together, we presented the following menu made with wild and locally-grown fresh ingredients bought from Mongu Market: Sikuswani Soup with Sikuswani Chip Sticks & Warm Ciabatta Bread; Seared Beef Fillet with Creamy Liondwe & Mwambwa wa Lindondwe Mushrooms, Pan-fried Green Beans with Roasted Cashew Nuts & Buttered Sweet Potatoes; and Munkoyo Panna Cotta with Guava & Muchingachinga Pureé on a Mongongo Nut Florentine. When I visited their table at the end of the meal, both Ministers expressed genuine delight in the food, not only because it was wholly Zambian, but because it reminded them of flavours they hadn’t eaten since they were young boys at the feet of their grandmothers. Beautiful and interesting pictures. Thank you so much. Unfortunately I push on the unsubscribe link on your last e-mail. Of course it’s a mistake! I like so much your posts. Beautiful and interesting on-the-go trip that was worthwhile of great pictures. Thank you very much. beautiful Easter !!!! Thank you, as always, for your interest and support! A very happy Easter back to you! I always look forward to your blog and always enjoy reading it. You’re a fantastic writer and photographer. Thank you for Sharing your experiences ? Fabulous and mouth-watering update of your recent journey! Great work with those mushrooms! Hiya Annabel! What a range of edible fungi – some different to what we have here in Zim! Super to see that you’re going from strength to strength, in fact you’re mushrooming! WELL DONE! By the way, my previous emails and phone messages have obviously not gone through to you. Zimbo hugs for you both. Cathy. I want to appreciate your effort in high-lighting various types of mush-rooms found in Western Province. I however think that your guide and translator did not do a good job in some names of our mush-rooms. There are; Ndwi-ndwi; Sibiti ( There is no “V” in silozi); Liondwe or sondwe singular; Nakandama and Liluwe; Sitongwani (Hyena) I don’t know why that type of mushroom is called such..it pale green in colour; there is silutoko usually grow in maize fields near water it is whitish in colour; there is bushele this is very unique type of mushroom found in very special areas I am yet to find out the unique environment where this thrives. I know of only one plce in Mongu Distric where it grows. I haven’t seen it anywhere else.